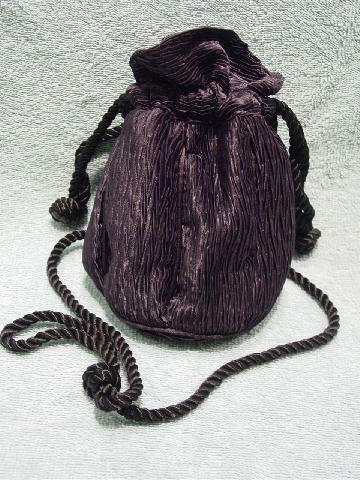 This thick black fabric purse has a thick cord 39" long strap and double cord drawstrings. The exterior fabric has a high-low texture which almost has a crinkled effect. It has a nice full black (probably acetate) lining. It has a thinner cord around the bottom and 6 accent cord vertical strips around the body below the drawstring closure and extending downward to the bottom.